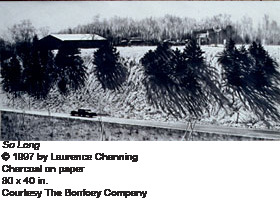 Laurence Channing is a chronicler of Cleveland’s distinctive architectural character; his compelling charcoal landscapes of streets, bridges and commercial buildings find an uncommon beauty in the urban grittiness of this rust-belt city. 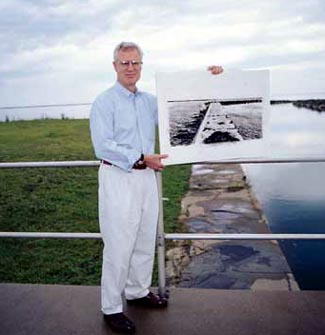 His 1999 solo exhibition at the Cleveland Center for Contemporary Art, numerous one-person shows mounted since 1990 at the Bonfoey and William Busta galleries, and his presence in several important public collections, including University Hospitals of Cleveland, the Cleveland Museum of Art and Case Western Reserve University, have garnered him high critical acclaim and an avid following. Deceptively photographic in appearance, Channing’s exquisite charcoal drawings are in fact guided by an acutely developed pictorial intelligence. His artistic process begins with long walks with a 35mm camera that documents in color selected views of unremarkable locales. Back in the studio, he translates this rich photographic detail into black and white compositions. Employing a technique that exploits the sensual qualities of his medium, he grinds his charcoal in a mortar and applies it with various homemade tools made from sticks and rags. Channing has noted that edges are central to his work and an astute viewer can observe that the remarkable range of muted softness and formal crispness in his drawings is achieved through the mastery of his edges. A creature of habit, he rises in the early hours to do his own work before setting off to his day job. Channing, who holds both a B.F.A. and M.F.A. 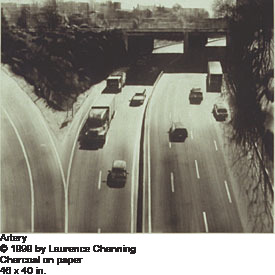 in fine art from Yale University, has supported himself with positions in publication, exhibition and interior design at the Wadsworth Athenaeum in Hartford, Isabella Stewart Gardner Museum in Boston, Philadelphia Museum of Art and Kimbell Museum in Fort Worth, where he worked with the celebrated architect Louis Kahn. In 1985, at the request of Evan Turner, then director of the Cleveland Museum of Art, he relocated to Cleveland with his wife Susan (director of Cleveland's alternative gallery space, Spaces) to become its director of publications. He persevered quietly for many years as an abstract painter. In the mid-1980s, faced with a crisis in artistic direction, he sought comfort in the immediacy of drawing and familiarity of his visual world. Something clicked and he segued from an abstract realm to a world of verisimilitude that defines his current enterprise. 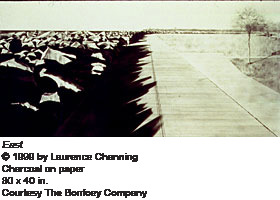 Channing is the master of a commanding and powerful emptiness. His compositions are visual moments arrested in mid-step and transformed into seductive, meditative worlds. Viewers are compelled to enter these uninhabited places where narrative is suggested but never provided. Like Virginia Woolf’s Mrs. Dalloway, Channing transforms a moment into an extended reverie that transcends time and place. His work lovingly acknowledges our humanity by making something timeless out of the fleeting present we all inhabit.